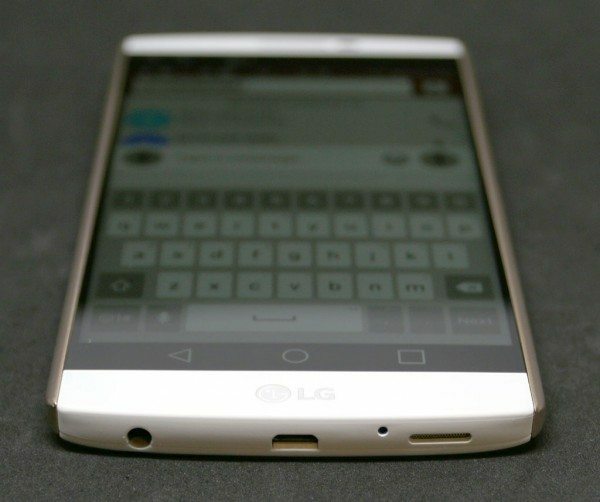 When I reviewed the LG G2 three years ago, I wasn’t convinced that LG’s decision to locate buttons on the back of the phone was a good idea. Who ever heard of putting volume buttons on the back of a phone instead of on the side? 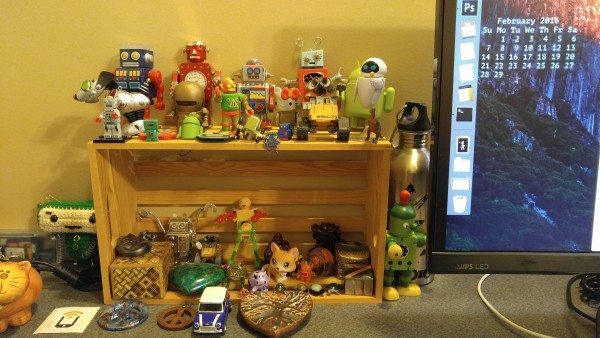 At that time, no one had done it before, but then one year later I ended up buying a LG G3 and quickly learned to love that unique feature. LG kept the same button location when they released the LG G4, and now three phones later, LG’s has a new flagship Android smartphone, the LG V10. Guess what? It also has the uniquely placed volume buttons. Verizon Wireless sent me the LG V10 to test for a few weeks and I found that the back buttons aren’t the only feature that’s unique to this phone. Let’s find out else what sets the LG V10 Android smartphone apart from other current smartphones. The LG V10, like the Nexus 6P pictured above on the right, is a large phone or phablet as many people like to call them. People with little hands and small pockets may find this phone to be too much for them to handle. But, bigger phones like the LG V10 mean a bigger display and usually a bigger battery, so it’s no wonder why tablet sales are down and phablet sales are up. Even though they say that good things come in small packages, that doesn’t mean that they can’t come in big packages too. Right? 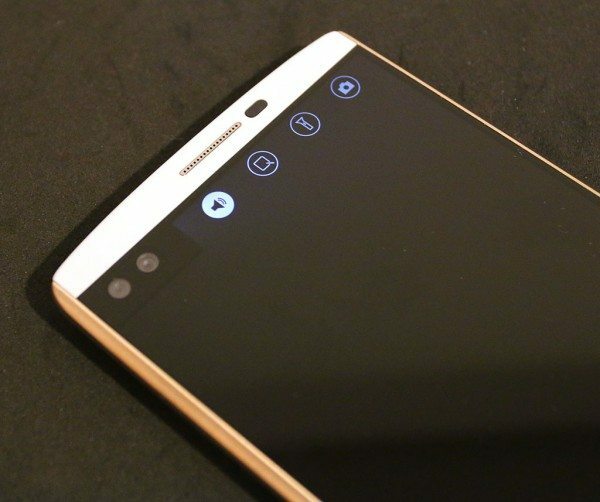 Verizon Wireless is offering the LG V10 in white and black versions. They sent me the white version. 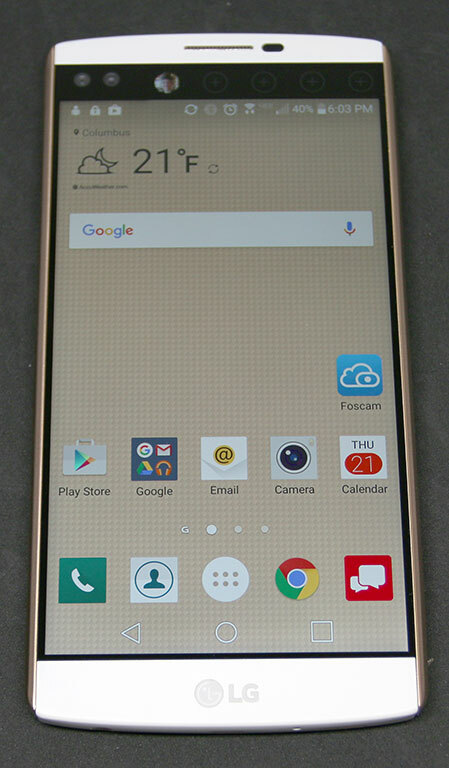 The front of the phone is mostly screen except for the top and bottom bezels. The LG logo is embossed into the bottom bezel and as you can see, there are no buttons to be found on the front or the sides. Above the screen is a speaker and an ambient light sensor. The Dura Skin cover on the back of the phone has a snazzy name, but it’s really just a flexible plastic cover with a raised crosshatch texture that provides extra grip. As mentioned earlier, the buttons that control volume and scrolling are located on the back of the phone along with the power button which doubles as a fingerprint scanner, the camera lens, LED flash and laser autofocus sensor. The flat power button is raised slightly higher than the volume buttons that surround it which makes it easy for your index finger to find the correct area it needs to press without needing to actually look at the back of the phone. I should note that I didn’t realize that the LG V10 had a fingerprint scanner until it occurred to me to look in the settings. When I checked the lock screen settings, I didn’t see any way to setup my fingerprint so I assumed that the phone did not have this feature. 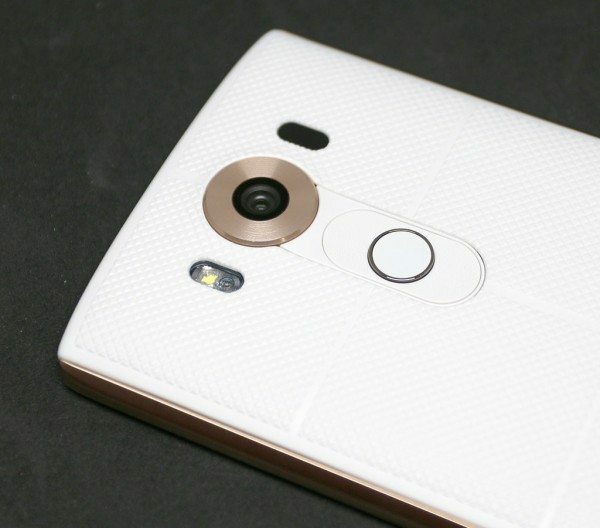 But then I googled it and was surprised to find that the LG V10 does indeed have a fingerprint scanner. The settings are just buried in the privacy section of the general settings. Setting up a fingerprint is similar to most newer phones that require you to move your finger over the scanner multiple times to record various parts of your finger tip. Once I recorded a fingerprint, I found that the LG V10 scanner worked very well. If I picked up the phone and used my index finger to press the power button to wake the phone, it would automatically scan and unlock without any other interaction. 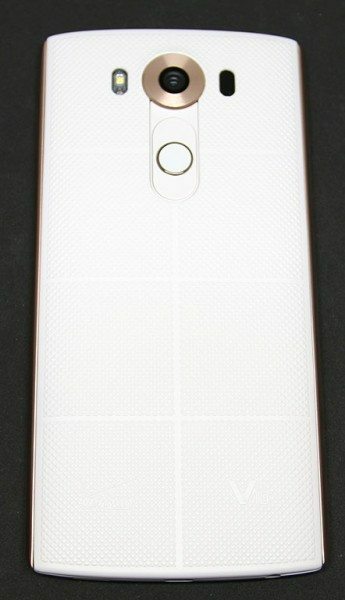 I like the back cover of the V10 because it has a rough crosshatch texture that gives it a nice non-slip grip. I also like that the cover is removable. Not many phones still have this feature these days, so it’s great that LG still does. The cover can be removed to access the replaceable battery, SIM slot and the micro SD card slot – another feature that is becoming rarer to find on newer phones. The V10 has a stainless steel frame with silicon bumpers for shock resistance. The metal sides on the white version of the phone have a rose, gold or copper colored finish. I can’t decide which the color it really is, but regardless of the color, it looks a little gaudy to me. That said, the sides are rounded and make the phone comfortable to hold. The top edge of the phone has an IR transmitter for the TV remote app, and a microphone. 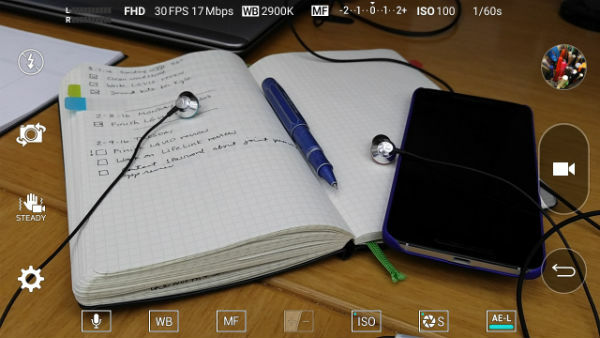 Another microphone is located on the bottom edge of the phone along with a speaker, a micro USB charging port which supports Quick Charge 2.0 and a 3.5mm headphone jack. Speaking of the headphone jack, the LG V10 has a 32-bit DAC which really makes listening to music through headphones very enjoyable. The LG V10 was the winner when I compared listening to the same music tracks on it and the Nexus 6P. I could hear subtle sounds, more bass, and all around richer sound through the LG V10 that I couldn’t hear through my 6P. I used my DUNU Titan 1 earphones with both phones. The LG V10 is a sturdy phone that easily passes my Gadgeteer squeeze test with no creaking, cracking or flexing. It feels good in hand, even though it’s a large (some would say bulky) slightly heavy phone. The texture on the back cover really helps you keep a secure grip on the phone and prevents it from feeling slippery. As far as looks, the style might not appeal to everyone, specifically the white version. It’s growing on me though. 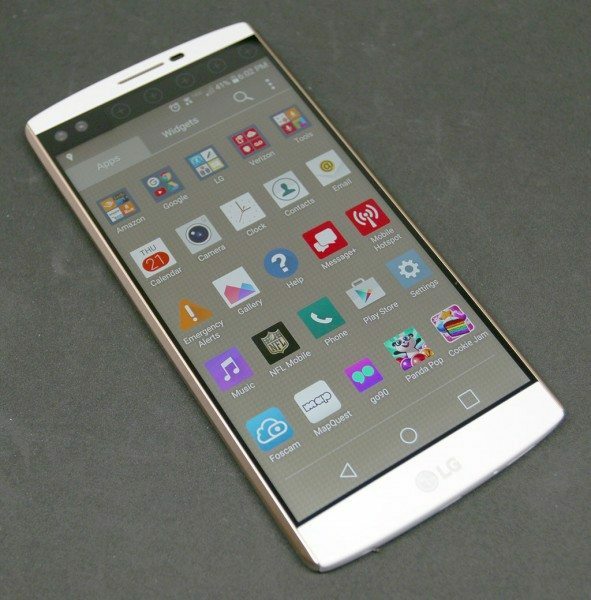 The 5.7 inch quad HD display looks great. The colors are vivid and the text is sharp. As far as touch screen sensitivity, I had no issues or complaints. Now that I’ve moved on from the LG G3 to the Nexus 6P, I forgot how much I liked the feature that wakes up the display when you double tap it with your finger. The V10 has this too and it works better/faster for me than the pick-up-to-wake feature on the Nexus 6P. There’s also the Knock Code feature that you can use to unlock the phone with a special tapping pattern that you create. Other than the back buttons, the main thing that sets the LG V10 apart from other smartphones is the second screen which is located above the main display. 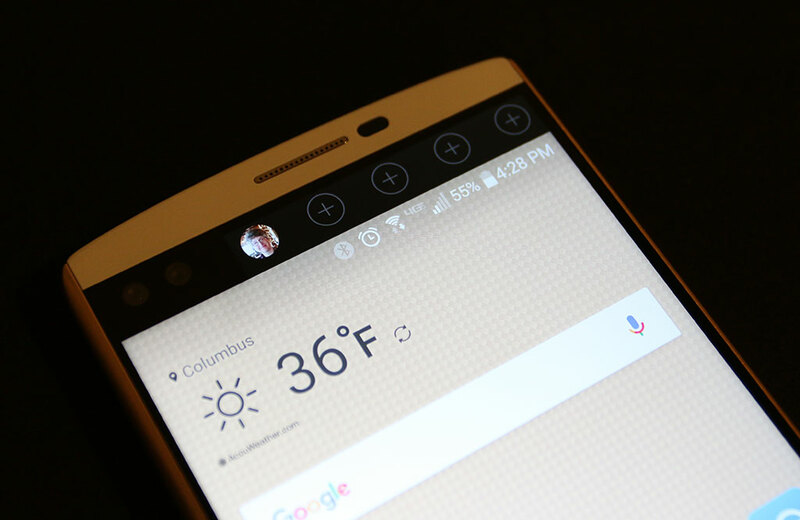 I know we’ve seen secondary displays before on phones like the Samsung Note Edge and Samsung Galaxy 6 Edge, but I think the LG V10’s second screen is better than the ones on those phones. Why? Well it’s not because you can customize it as a launch bar with icons of your five favorite apps. That’s a nice feature, but I didn’t find myself using it very often. And it’s not that you can configure the screen with five favorite contacts for a quick connect bar. Or that you can setup the second display as a media controller, recent apps list, favorite phrase or to show upcoming appointments. You can configure all six of these menus and then scroll through them by swiping the second screen. Sure, all those features are useful, but none of them are why I like the V10’s second display so much. 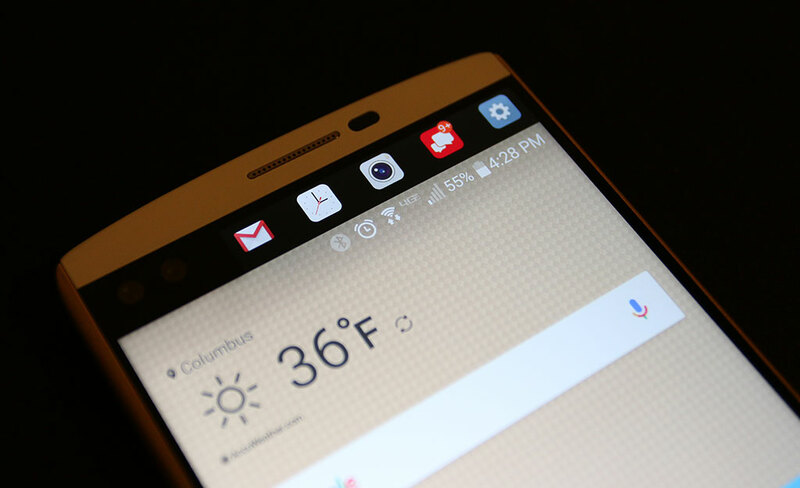 The reason why I like the LG V10’s second display is because it’s always on. Even when the phone times out and the screen goes blank, the second display will still show the time, date, weather, notifications icons and battery status. This is my favorite feature of the whole smartphone, the fact that it has an always on clock that I can quickly glance at to see the time without picking it up, waving my hand over it or tapping the display. I also like that I can see if I have an unread text message or a Google Hangouts message without having to decipher status LED colors. When the phone is locked you can also swipe across the second display to see another set of icons that can be used to mute the speaker, launch the quick memo app, toggle the LED flash on the back to be used as a flashlight and launch the camera app. 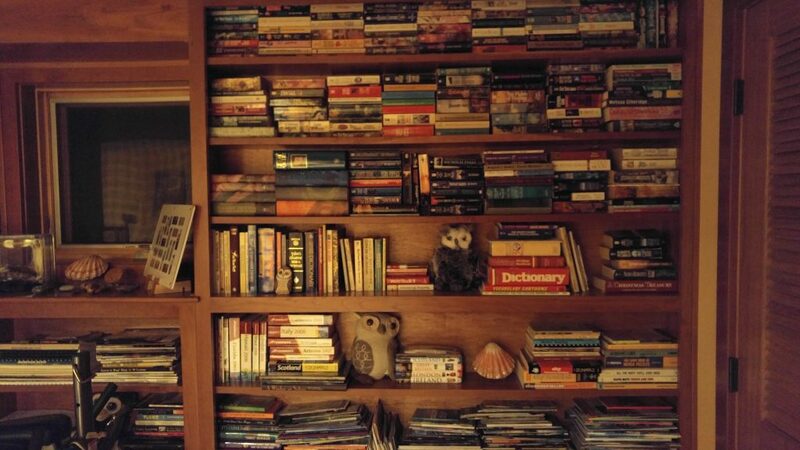 Take a closer look at the image above. See the two circles on the left side of the display? They are two front-facing 5MP cameras. 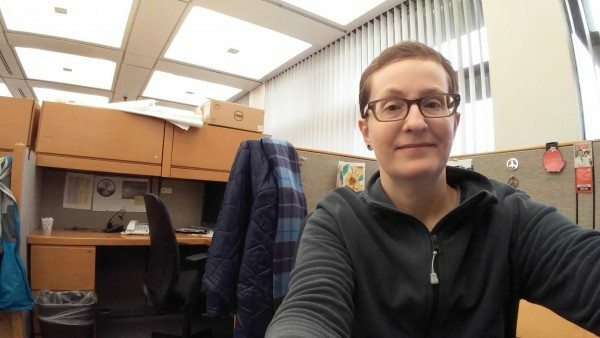 Why do you need two front-facing cameras? For wider selfie shots of course! Here’s a selfie with the LG V10. And here’s another selfie with my Nexus 6P. You can see that the V10 has a wider image. I will say that it’s a lot easier to take a picture with the Nexus 6P than the V10 because you can use the side volume button as a shutter button. With the LG V10, it’s not always easy to use the volume button to snap a picture since it’s on the back of the phone. Of course you can use your finger to tap the onscreen shutter button, but even that can feel awkward when you’re holding such a large phone. No flash with ample overhead LED lighting. Low light shot with Auto settings, no flash. Weird yellow cast and a bit grainy, but not bad for very little light. Low light shot with Auto settings, automatic flash. Close up focusing on the fat pink marker cap in the center of the image. 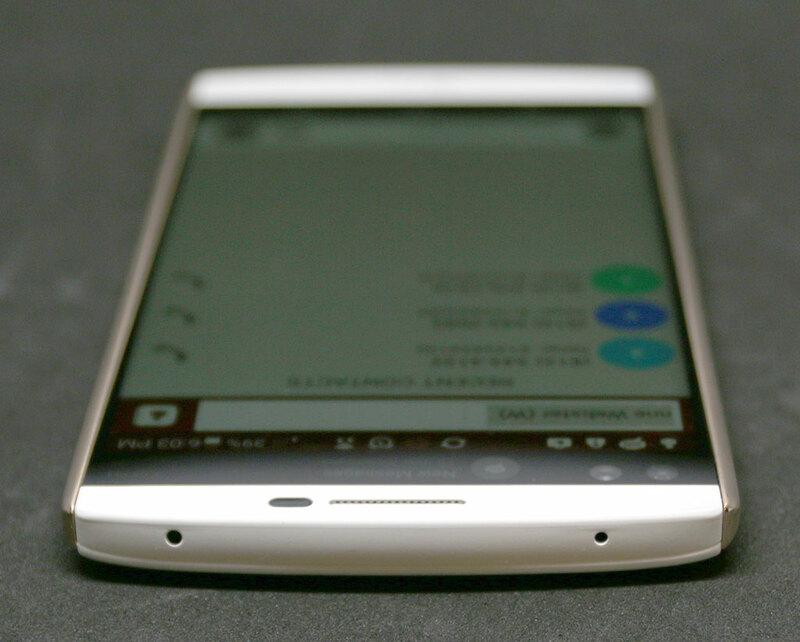 The LG V10’s 16MP camera which is essentially the same as the LG G4, is supposed to be very impressive. But it didn’t really impress me that much. I guess if I were a real photographer I’d like all the extra manual settings available in the camera app. But I don’t care about the manual settings because I just want to press one button to capture a good pic without having to think about shutter speed, ISO, etc. I’m not saying the LG V10’s camera is bad, because it’s not. It’s a decent shooter. But it just didn’t blow me away like it was supposed to do. Maybe it’s because I wasn’t able to get outdoors to take some nice nature shots since it’s winter right now and we rarely see the sun these days. I see other people raving about the V10 camera in various reviews, so I’m a bit bummed that I didn’t feel the same way. LG Health, Amazon apps, NFL Mobile, MapQuest, go90, Panda Pop, Cookie Jam, Empire, Slotomania, Hotels.com, Slacker Radio and Android Pay. 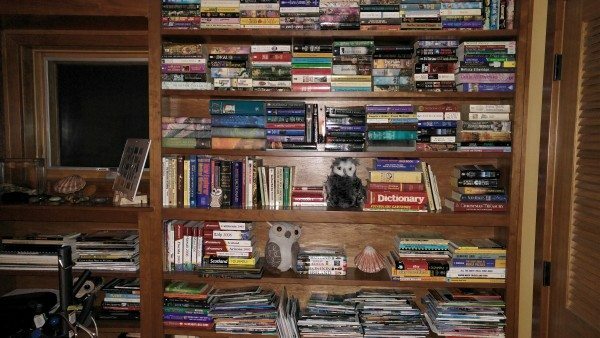 Some of these extra apps can be uninstalled like: Hotels.com, Slotomania, Empire, Cookie Jam, Panda Pop, go90 and MapQuest. But you’re stuck with Slacker Radio, NFL Mobile and the Amazon apps. I didn’t have any complaints from people I talked to while testing the LG V10. Conversations on both sides of the call were clear and with ample volume. I also did not have any issues with dropped calls while testing this phone. Signal strength seemed to be no better or worse than other phones I use on the Verizon network. Performance felt equal to other newer smartphones I’ve recently tested. I found that apps launched without a noticeable lag, and there are no issues switching back and forth between apps. I also didn’t have any issues with the LG V10 freezing or crashing. When it comes to battery life, the LG V10 felt a little better than average which surprised me since the second screen is on most of the time (it will go off it the phone is in total darkness like your pocket or a dark room. 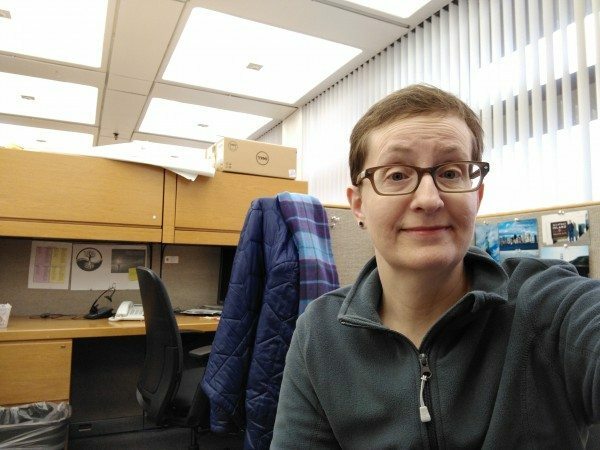 I was able to easily make it through the day and sometimes into a second day without needing a recharge. 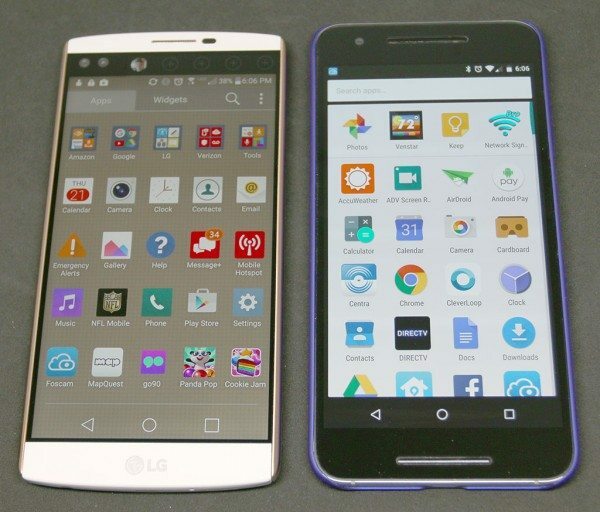 I was a little confused when the LG V10 first came out because I didn’t see a need for another line of LG phones that are so similar to the LG G4. Now I am seeing that the LG G5 which will soon be unveiled, will also have a second screen. 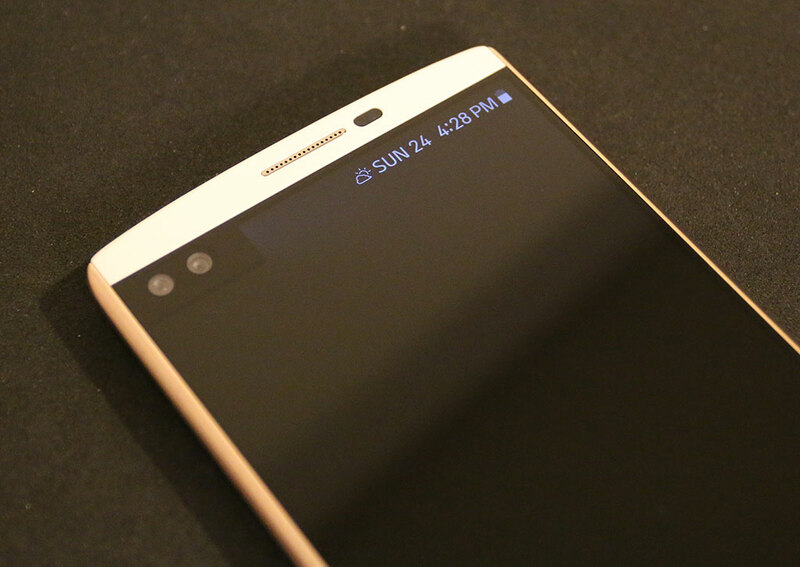 Regardless as to why LG decided to create the V series, the LG V10 is their flagship phone. A fact which is backed up with a flagship sized price tag. The V10 has a lot going for it. But other than the second display, the LG G4 is the better buy because it’s less expensive and is slightly less bulky. 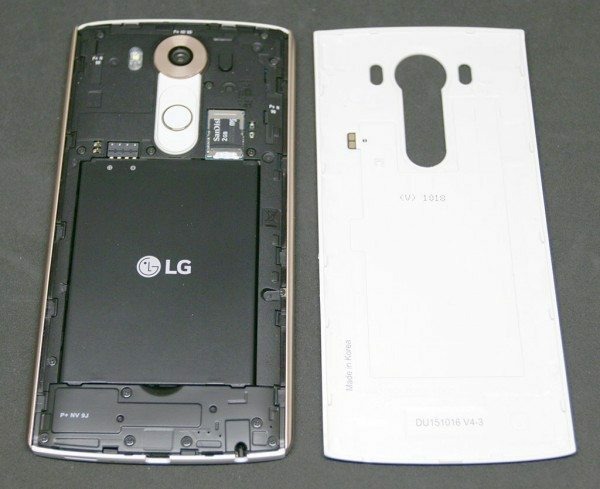 However, the G4 only has 32GB of memory compared to the V10’s 64GBs of memory. So it all comes down to your wallet and which phone you like best as far as looks and features. The V10 is definitely the one to beat right now for a smartphone that has a swappable battery and micro SD card memory expansion. It also has the potential to get a wireless charging back cover, which would make this LG flagship smartphone even better. Now I’m wondering what the LG G5 has in store for us. Source: The sample for this review was provided by Verizon Wireless on a short term basis. Please visit their site for more info. Had the V10 for 2 weeks now. Really solid. Very few complaints…for power users, battery life does not appear to be that great (less than 24 hours if you turn your phone on a lot…something’s gotta power that big screen). Verizon Visual Premium Vmail works on the V10 but not the Nexus. Double tap on screen is good though am not sure if the new messaging app is as smooth as it could be. I’ve had my V10 since November when T-Mobile made me an offer I couldn’t resist. I got if before the 11\15 cut off for the free battery, charger and 200G sd card (I love what competition has done for the cell phone world). 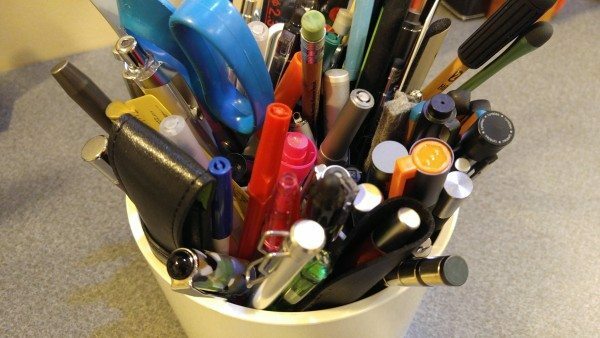 I have had a replaceable battery since the Bluedbird in 2005. I added a removable storage for an HTC a few later. The V10 met those criteria as well as a huge screen (old age is a drag). An interesting thing has happened, even though I got a 3rd battery and the LG wireless charging back. I rarely change the battery and even more rare, use the wireless charging circuit. Quick charging has made me consider the Galaxy S7. This feature is awesome! 5% to 100% in around an hour! Unfortunately, the European variant has only 32 gb of internal storage. I am also having issues with connecting it via Bluetooth to my car stereo. The phone itself will work, but music wont play. Other than that its a great phone. I really liked wireless charging for the LG G3, but the promise of speed of charge was one of the factors in my my jump to the LG V10. Unfortunately, it doesn’t support quick wireless charging. I tried a couple chargers (with the original LG cable and charger). It was never as fast plugging the phone in. The Galaxy S6, had too many drawbacks for me, but I have experimented, and it did support wireless quick charging. The S7 Edge + with a 3600 battery and a SD card slot, is pretty enticing. I think T-Mobile would let me do a”jump” to that in March. I’ve never heard of this issue… It almost sounds like something is connected with the phone to cause it to dial. Does the phone call numbers in your contacts list or just a random number? Lg v10 will go into a bootloop after approx 1.5 years. Lg has acknowledged a manufacturing problem regarding the solder joints that connect the cpu and ram chips to the motherboard. Google ” lg claas action lawsuit ” to get the lowdown.